"This is a very simple to make. Seasoned rice and peas make an excellent main meal. I am sure it will become a favorite once you try it." Heat a saucepan over a medium heat. Add butter or margarine and let melt. Stir in cloves, cinnamon, Serrano chile, and ginger. Saute briefly. Mix in rice and stir to coat it evenly. Stir in peas, salt, and sugar. Pour in water and bring the water to a boil. Reduce heat to simmer and let rice cook covered for 15 to 20 minutes; or until rice is tender. Quick weeknight stir-fry chicken and veggies! The whole family LOVED this unique flavor with a mild kick! 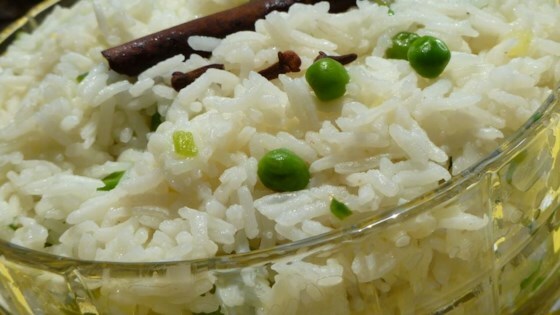 My son hates peas but ate all of them when they were surrounded with this yummy rice! As a non cook it was SUPER EASY! Simple and delicious. I used frozen peas. Tasted great. Thanks for the recipe! This was very tasty. Smells wonderful when cooking too! The only thing I did different was omit the sugar and add minced garlic. Thanks for sharing. Didn't have a serrano, but had a jalapeno in the fridge, so I used that. The spices all complement each other very well but don't dominate the flavor. Nice side dish. I loved it. the smell was so good while cooking. Wakes up the taste buds, as this combination of spices is one I rarely use. Even my 4-year-old liked it! Great side or every-day dish.